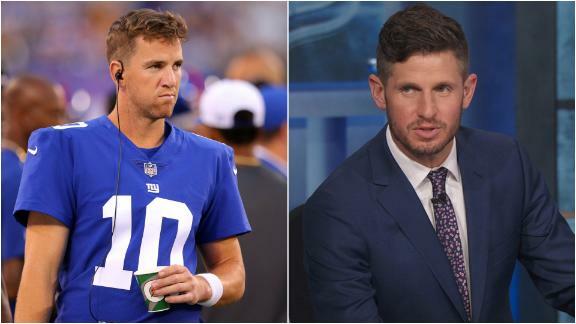 EAST RUTHERFORD, N.J. -- Eli Manning expects his potential successor to be added to the roster later this month, believing the New York Giants will select a quarterback in this year's NFL draft. The Giants have the sixth and 17th picks in the first round of the draft. Manning sees where this could be heading. "Yeah, I figure the Giants are going to get a young quarterback. So I understand that," Manning said Monday, on a day when Ohio State quarterback Dwayne Haskins was making his top-30 visit at the team's facility and the Giants began their offseason workout program. "I still have to do my job, and I'll do my part. And my job as I see it is to go out there and play quarterback and win football games. That is what I'll do." Haskins' visit is scheduled to stretch into Tuesday. Oklahoma's Kyler Murray and Drew Lock were also at the Giants' facility last week. Coach Pat Shurmur had told ESPN in recent weeks that the team intended to have all the top quarterbacks visit. That group included Duke's Daniel Jones and West Virginia's Will Grier. Giants ownership explained at the NFL annual meetings that the team would like to come out of the draft having addressed the quarterback position. Manning is 38 years old and in the final year of his contract. But the value of the Giants' picks has to align with the grade on the quarterback. That makes it just as likely the Giants could land a quarterback at pick No. 17 as 6. "I would like to come out of this draft with a quarterback, but here is the thing: Show me what the grades are," co-owner John Mara said recently. "What is the value there? If the top quarterbacks are graded towards the bottom of the first round or even the second round, I'm not going to insist we take him at No. 6 or even No. 17. Show me what the value is. That has always been our philosophy on that. The worst thing you can do is try to force the issue and then you end up with a quarterback that isn't worth taking at that particular spot. "Would we love to have a quarterback coming out of this draft? Yes. But only if we have a conviction about him." Manning understands that part of his role this season could be working alongside another young quarterback. It's nothing new. The Giants drafted Davis Webb in the third round two years ago and Kyle Lauletta in the fourth round last year. Webb is now on the Jets. While Manning doesn't necessarily view his job as being a mentor, it doesn't mean he won't be willing to help. Webb has consistently raved about working alongside the two-time Super Bowl winner. Manning abides by the lead-by-example philosophy. "That's just kind of part of being a quarterback," he said. "Enjoy putting in the extra effort and work to get everybody up to speed and help young guys when they're trying to learn a new offense." Manning's concentration now is on being a good teammate and getting the team ready to win football games. He told the Giants immediately after the season about his desire to continue playing even after a rough season. That came during what general manager Dave Gettleman described as a "no-holds-barred" meeting. Manning said he wasn't told about his fate by Gettleman and coach Pat Shurmur until about a month ago, when the Giants made their intention clear of having him return as the starter. Nobody seems all that concerned that it's the final year of Manning's deal, and ownership wants to take a wait-and-see approach with his future. "I don't feel the need to talk to him about his contract," Shurmur said. 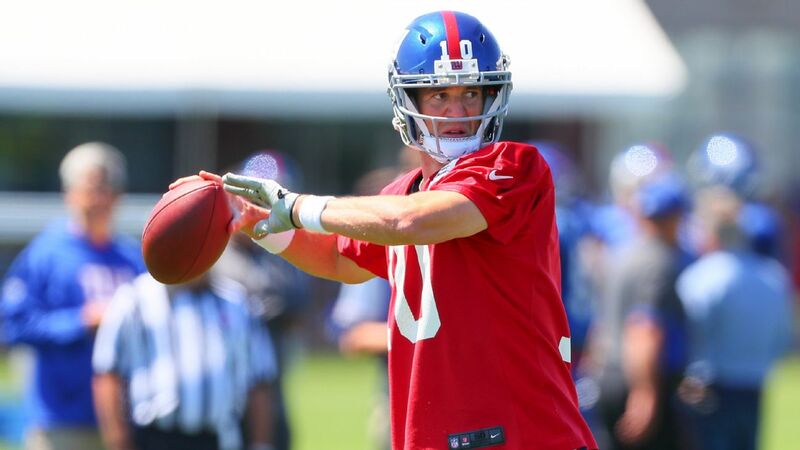 "Eli does a great job of staying in the moment. He was here today and we got going. He is excited to get into this, the second year of our system and build on what we did the last half of the season. Eli is really terrific at staying in the moment. Right now, it is offseason training. Just trying to get comfortable with his receivers and try and master his decisions. I think that is where he is at. I don't feel the need to talk about that with him." Manning admitted that his concern is with the present, not the past or the future. Having been in the league for 16 years, he wasn't even surprised by the recent trade of star wide receiver Odell Beckham Jr., which he claims to have found out about on TV when it came scrolling across the ticker and texts started crowding his inbox. He apparently won't be surprised by the addition of a quarterback in this year's draft either. 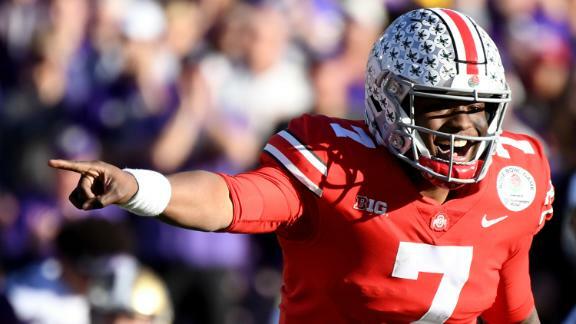 Former Ohio State QB Dwayne Haskins has a prototypical stature and all the tools to be a successful pro. Will he go to the Giants at No. 6?